This summer, I've had the opportunity to reconnect with a dear friend from my freshman year of college. She and her husband + 5 kids are living nearby for the summer and we have been getting our kids together weekly for swimming, sleepovers and tons of fun. Our kids have never met before this summer, but they have become fast friends. It has been an absolute blast. 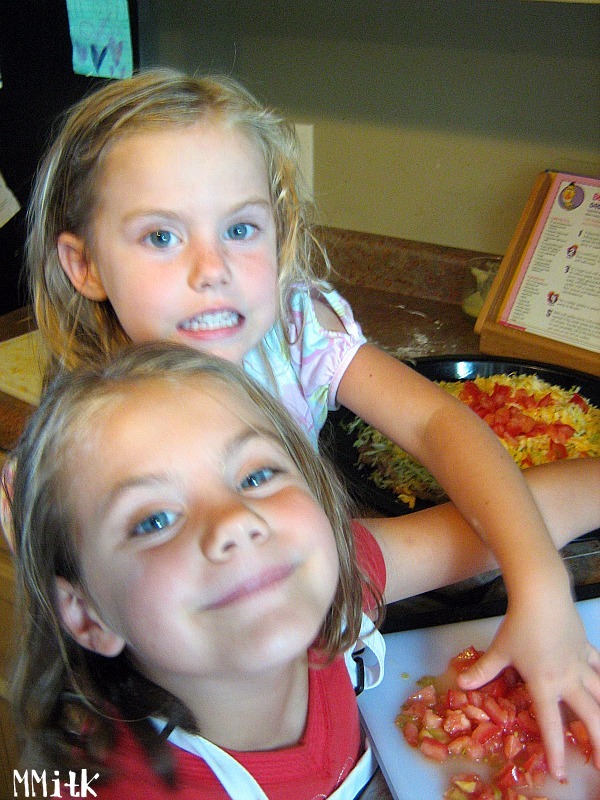 Last week, we were throwing together dinner for the kids- we ended up making sprinkle pancakes, steamed broccoli, corn on the cob, turkey sausage, and watermelon- and I had torn out this recipe from the most recent issue of Cooking Light. I had all the ingredients, so I decided to make a little something special for the adults. This recipe was under the 5 ingredient section of the magazine and took about 30 minutes to throw together. For the amount of time it took and the small number of ingredients it contains, I would have to say it is pretty good. I added some olive oil just because I felt it needed a little something and next time I will add some fresh lemon juice. It was almost too sweet for me, with the peas and the watermelon, I would have liked some feta or something to cut the sweetness. 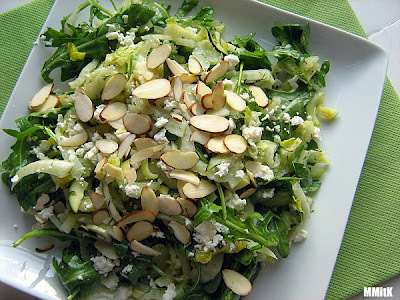 I prefer my salads to be on the savory side, but it was enjoyed by all of us and a nice change for a quick summer meal. 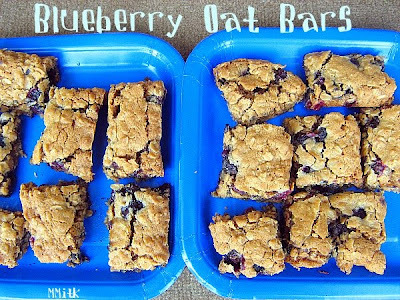 When my sister and brother were here visiting in June we had a bunch of blueberries and decided to make these Blueberry Oatmeal Bars. They were so good. Delicious right out of the oven and later, once they had cooled. I sent the leftovers with my husband to work and he kept commenting about how good they were. I didn't take a picture of them because I didn't get a chance. Then, a few weeks later, we had lots of blueberries from picking at Grandma's, so we made them again. My girls helped measure, mix and stir. They had a blast scraping the batter into the pan and smoothing out the top. Then, they anxiously waited for the timer to go off. This time, I took a picture and shared them at a dinner. They received rave reviews from everyone who tried one, even a few people who don't like "real" blueberries cooked into desserts. This recipe is definitely a keeper and it is a fun one to have little ones help you make. Preheat the oven to 350 degrees. Line a 13 x 9 baking pan witth aluminum foil. Lightly spray the foil with cooking spray. In a small bowl, whisk together flour, cinnamon, baking soda, and salt, and set aside. In a large bowl with an electric mixer on medium speed, beat together the brown sugar, granulated sugar, and butter until fluffy. Beat in the oil, eggs, and vanilla. With a wooden spoon, mix in the flour mixture until blended. Stir in the oats and blueberries. Bake until golden brown and a toothpick inserted in the center comes out clean, about 30 to 35 minutes (or longer). Transfer the pan to a wire rack to cool completely. 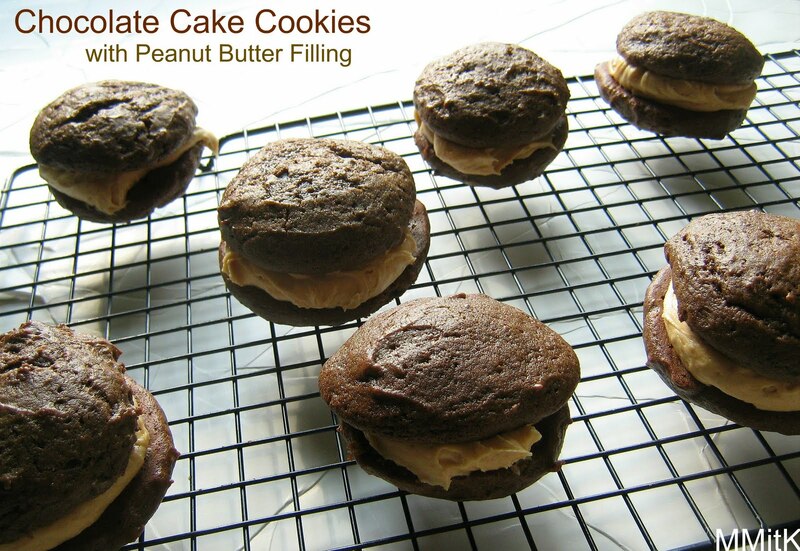 Lift by the parchment or foil from the pan and cut into 24 bar cookies. 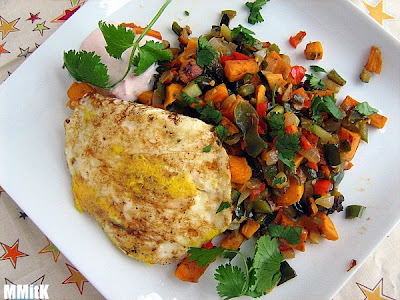 I wasn't really expecting too much out of this dish, but it ended up really surprising me. The ingredients are fairly simple. There aren't a ton of seasonings, but I think the cooking method helps this dish have a risotto-like texture. 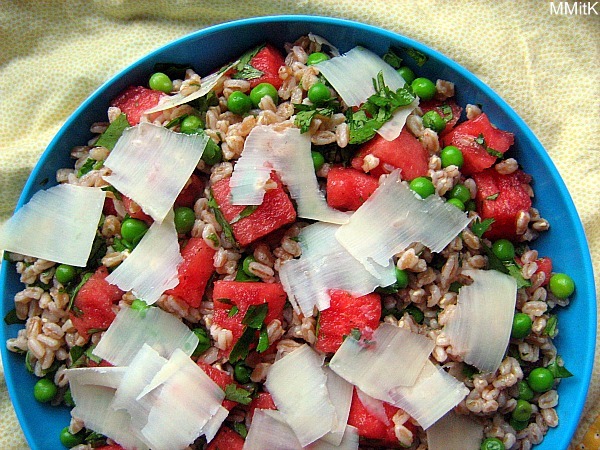 The brown rice is really good and takes on a different texture than it normally does. 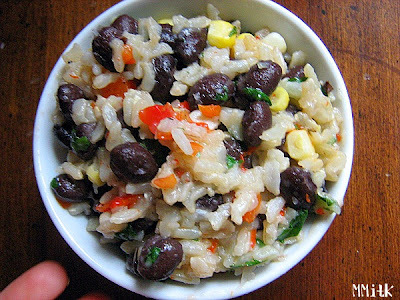 The fresh corn kernels and black beans make it so hearty. It was good the first day right out of the oven, the next day cold out of the fridge, and the third day we used it as a filling for burritos. I love dishes that can be used in multiple ways and that stretch over many days. My husband's grandmother has bunches of blueberry bushes in her yard and those berries were ready for picking a few weeks ago. Luckily we had a morning that wasn't too hot or humid- it was actually a little bit overcast, and we set out to pick a large amount of blueberries. The kids were great helpers and we ended up bringing home over a gallon of fresh blueberries. Frozen blueberries are a favorite treat of my husband's and my kids, so I made sure to freeze a bunch of them, but I also wanted to make a breakfast treat with some of the berries. I decided on this recipe because it doesn't contain whole grain flour. That may sound funny, but I wanted to make sure that my husband would eat these pancakes and he usually turns his nose up to the usual whole wheat pancakes or waffles I make. So these were definitely a treat for him. The batter is nice and thick and it holds the blueberry perfectly. 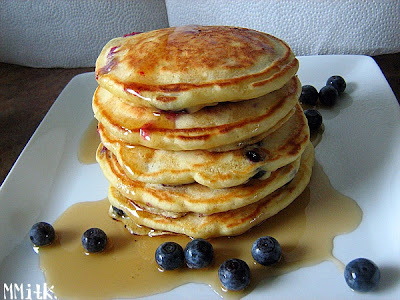 These pancakes were light, fluffy and chock full of beautiful blueberries. This is the perfect thing to make with children in the kitchen. It is fun for the kids to help open cans, chop things, spread the layers and sprinkle everything on top. My girls and I decided to make this dip for a family dinner with a Mexican theme. Mostly because I can remember making it as a child with my family when we would get together with my cousins. I remember everyone taking part in preparing the different layers and then putting it together. I haven't made this dip since I've been married, although I have tried other versions, like this Meditteranean one and a lighter one for a cooking group I was in. My advice is to taste test the different layers as you go along to make sure they have the right flavor and let someone help you put it together. We had a lot of fun. If you are lucky enough to have any leftovers, try them with scrambled eggs, in some sort of burrito or as part of a salad. 1. 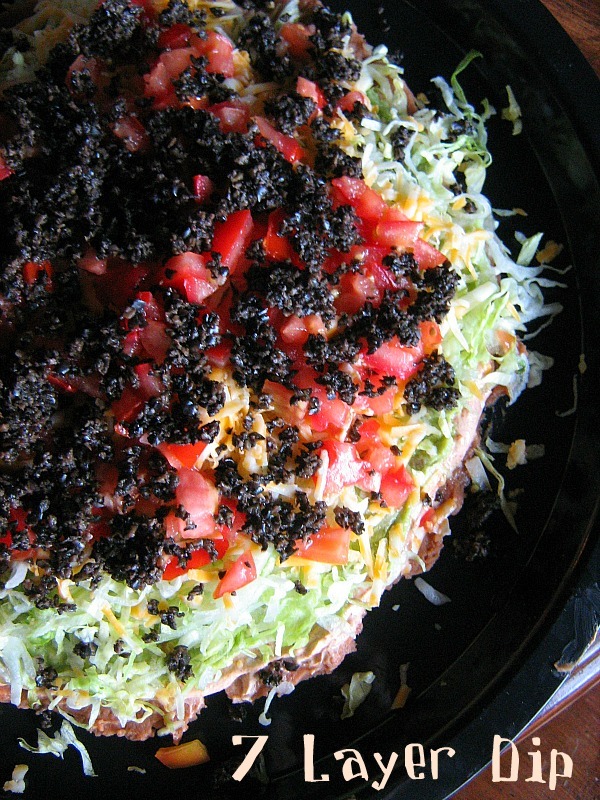 On a large platter or in a deep dish, spread the bean dip/refried beans in a even layer. 2. Combine the taco seasoning and sour cream in a bowl; spread on top of bean layer. 3. Mash the avocados with a few Tbls of freshly squeezed lemon juice; season with salt and pepper. Spread the avocados over the taco sour cream mixture. 4. Sprinkle shredded lettuce on top of avocado, followed by the shredded cheese, chopped tomatoes, and sliced black olives. 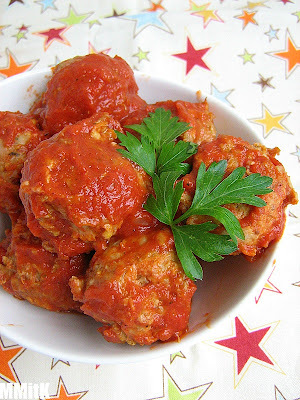 Aggie shared this recipe on her Facebook page a few weeks ago and as soon as I saw the recipe, I knew I would be making these for dinner asap. I had picked a couple of eggplant from my garden the day before and couldn't wait to serve these up for dinner. 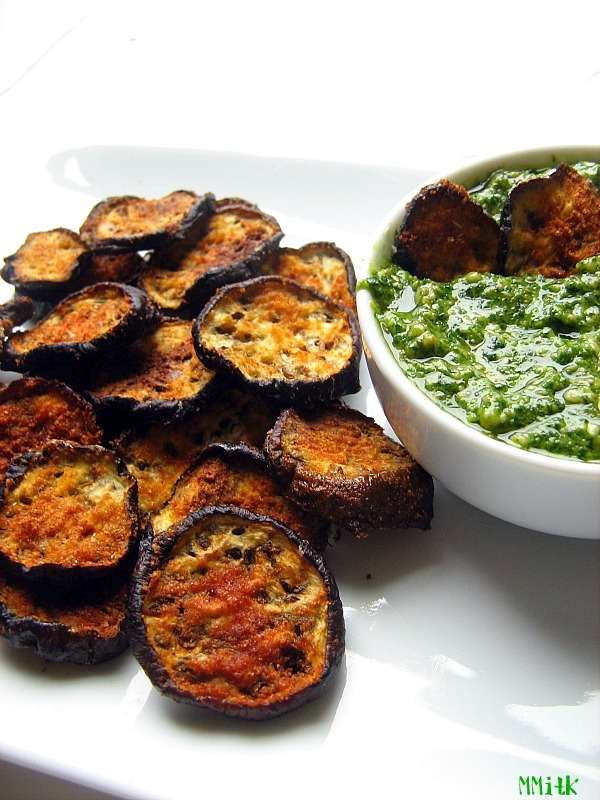 The burgers contain eggplant in 2 ways- steamed cubes and shredded. A few other ingredients are mixed in and then they are ready to cook. They are topped with a delicious homemade tzatziki sauce and Aggie suggested serving them on toasted english muffins. I was happy to add a slice of homegrown tomato. Nothing beats a tomato from the garden! These were a huge hit with my daughters. My 4-year old gobbled hers down and was the first one finished. My son was not a huge fan, but he doesn't really care for eggplant in any way. He still finished his though. I was glad that there was one burger leftover for me to have for lunch the next day! It seems I always have a little bit of something leftover in my fridge. This time, it was sour cream. I had exactly one cup and needed to make a dessert to accompany the dinner I was taking to a family who had an unexpected event occur. We also had a teenager staying at our house, so I knew these would be fun treat for us as well. I didn't try one, due to my not consuming sugar goal for the month, but they were very popular with the kids. The teenager who was at our house was so confused by the fact that a cookie could be like cake. It was fun to show him that it is possible to make cake cookies. These are a really great sandwich cookie and nothing goes better with chocolate than peanut butter! Getting Ready: Position the racks to divide the oven into thirds and preheat oven to 375f. Line two baking sheets with parchment or silicone mats. Whisk together the flour, cocoa, baking soda, salt, cinnamon, and nutmeg. Working with a stand mixer, preferably fitted with a paddle attachment, or with a hand mixer in a large bowl, beat the butter on medium speed until it is creamy and smooth. Add the sugars and beat for two minutes or so, then add the eggs one by one. Beat for another minute-the mixture should be smooth and satiny. Reduce the mixer speed to low and mix in the vanilla and melted chocolate. With the mixer still on low speed, add the dry ingredients and the sour cream alternatively, adding the dry ingredients in 3 batches and the sour cream in 2 (begin and end with the dry ingredients). Mix only until the ingredients are incorporated and the batter is smooth, then mix in currants. Drop the batter by heaping teaspoonfuls onto the baking sheets, making certain to leave 2 inches between the spoonfuls. Bake for 12-15 minutes, rotating the sheets from top to bottom and front to back at the midway point. The cookies will puff, spread and round themselves out in baking. They’re done when they are set on top but still springy to the touch. Pull the sheets from the oven and let the cookies rest for 1 minute, then, using a wide metal spatula, carefully transfer them to a rack. Cool to room temperature. In a stand mixer, beat the sugar, butter, peanut butter on low until combined and then on medium until smooth. Add the liquid, and beat until combined- this should lighten the mixture a bit and make it easy to spread. Once the cookies are cool, try to match up similar cookies into pairs. Spread about a tablespoon of filling onto the flat side of one cookie and gently press the flat side of the second cookie to make a sandwich. I made these little dessert cups almost 2 months ago and somehow they just haven't had their time to shine yet. I made them for no reason really, just because I saw them in an issue of EveryDay Food Magazine and they looked interesting and I had extra egg yolks I was trying to use up. 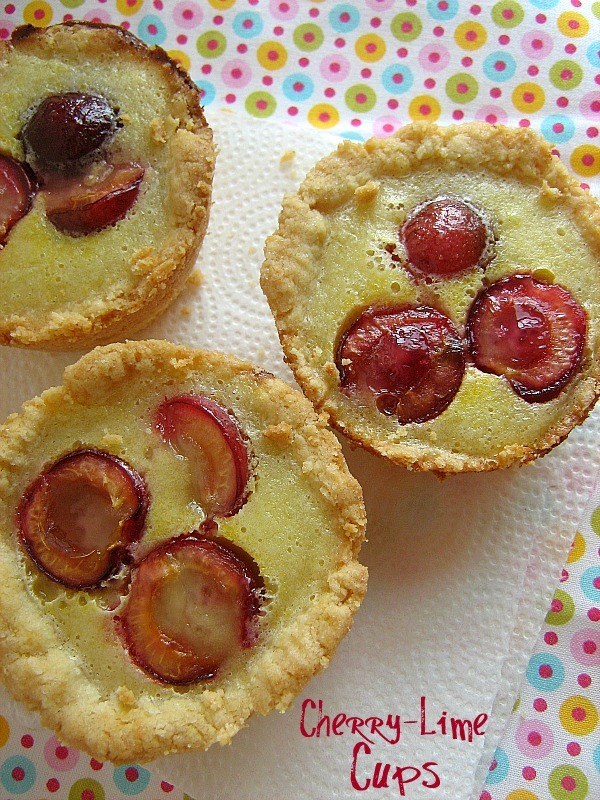 They consist of a tart-like crust, a simple lime filling and fresh cherries. I made my husband take them to work and they received rave reviews. 1. Make crust: Preheat oven to 350 degrees F. Lightly butter six standard muffins cups. In a food processor, process butter, flour, sugar, and salt until mixture resembles coarse meal. Add yolks and vanilla and process until dough comes together when pressed (dough will be crumbly). 2. Divide dough into 6 pieces. Roll each into a ball and place in a muffin cup, pressing evenly into bottom and up sides. 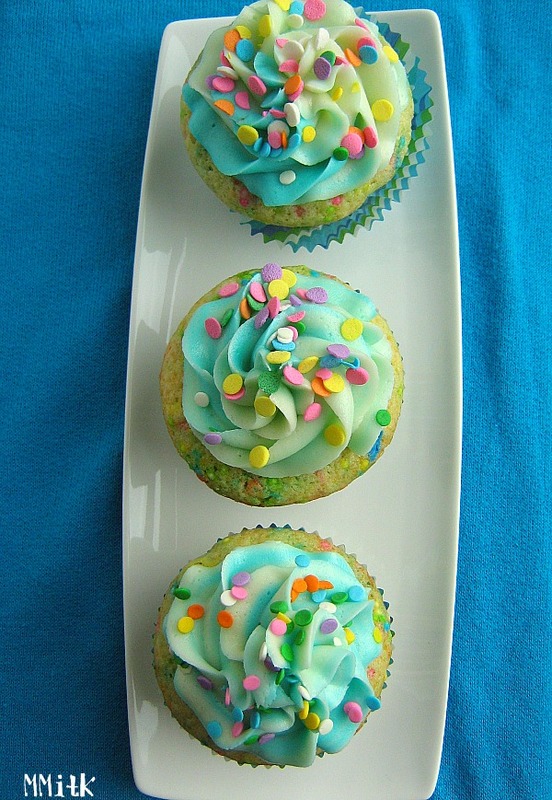 Place a paper cupcake liner into each muffin cup over dough and fill with pie weights or dried beans. Bake until edges are dry, 15 minutes. Carefully remove liners and weights; bake until crusts are dry and barely golden, 5 to 7 minutes. I recently made a three layer cake for a birthday and had leftover blue and white frosting. What's the only logical thing to do when you have leftover frosting? 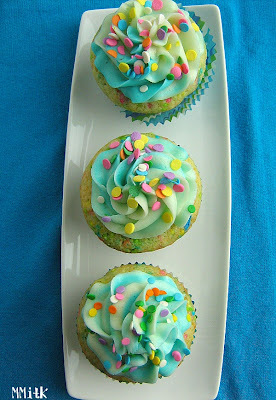 Make cupcakes, of course! 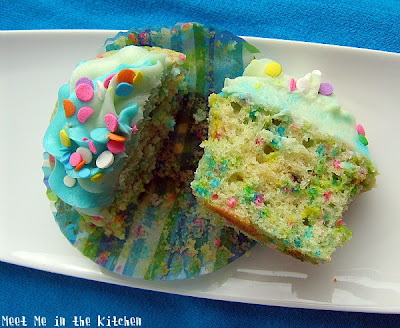 Somehow I found this recipe for Funfetti Cupcakes and thought it would be a fun one to take to a family dinner that was happening later that evening. There were going to be a bunch of kids, so I knew these would have no problem being consumed. 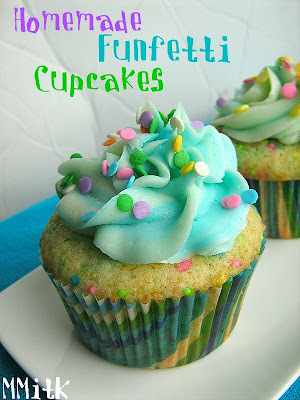 I heard from a few people who tasted these cupcakes that they were really good. I didn't try one, because I am not eating sugar this month, but I trust the sources that said they were tasty. Plus, they look kind of cool too. I found it!! I finally found it- Farro that is. I have been looking for it for quite a few months and couldn't find it anywhere. I have seen quite a few recipes that use it and even made one that was supposed to contain it. But, then a couple of weeks ago, I saw it in the bulk bins at EarthFare and bought a bag full. I would say that the texture is similar to wheat berries or barley, but the flavor is a little bit different. 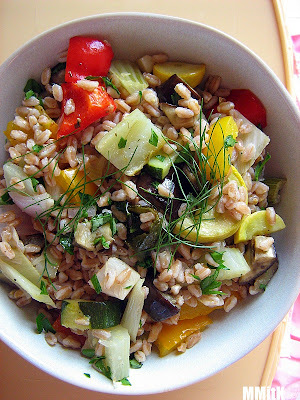 I had tons of veggies from my garden and found this great recipe that combined farro and roasted veggies. It is a recipe from Jamie Oliver and it was wonderful. I was able to use zucchini, summer squash, and bell peppers from my garden and there was also fennel thrown into the mix. Roasted fennel is so delicious. I made this when my sibling were visiting me and we continued to eat it throughout the week. The leftovers are great. My siblings begged me to make this sweet treat while they were visiting. 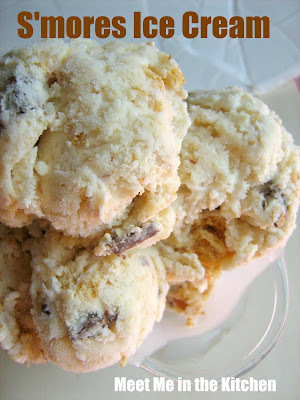 I had mentioned a couple of things that I had been wanting to make and when they heard S'mores Ice Cream- that was it. I like s'mores anything since graham crackers are a serious problem food for me, so I decided it would be better to make this ice cream when I had extra mouths around to eat it. I had a couple of issues getting my ice cream to the right consistency because my countertop Ice Cream Maker couldn't handle the hot ice cream mixture. I wrote more about it below the recipe. Once we got a couple of problems worked out and we added more toasted marshmallows, we were in business. This ice cream was delish. 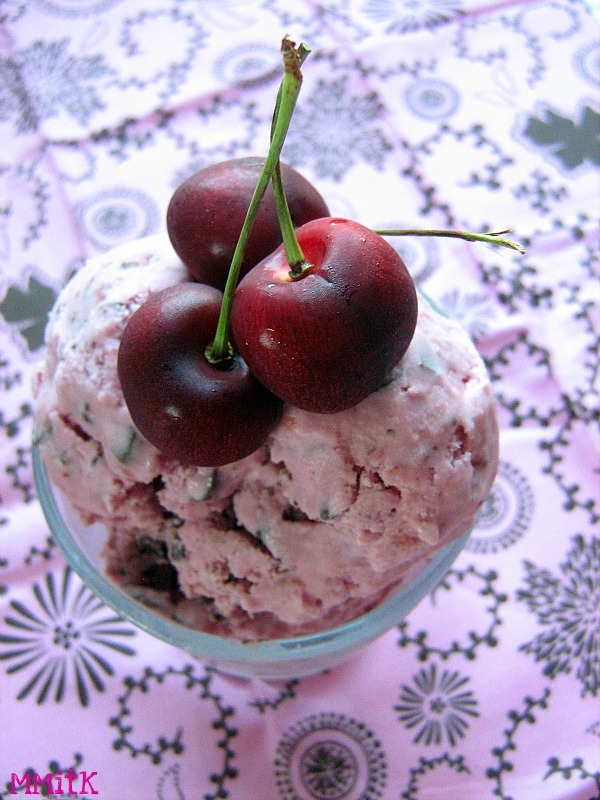 A friend who tasted it a couple days after it had churned said it was the best ice cream he had ever tasted. If you like s'mores or any or all of the flavors involved in s'mores, I'm positive you will love this ice cream. * I tried to make this recipe the way it said to, but my ice cream maker couldn't handle the hot mixture, so I put it in the freezer to thicken up a little bit and then rechurned it. The marshmallow flavor wasn't very pronounced so I toasted a bunch more jet puffed marshmallows under the broiler and just stirred them into the ice cream. This was fabulous- it left some larger chunks of marshmallow in the ice cream that were soo yummy. Fennel is something that I am really beginning to love. I avoided it for many years because I knew that it had anise/black licorice flavor, but when I first tried it raw in a salad last year, I discovered that it is really delicious, and that the anise flavor is not very pronounced. When my brother and sister were here we needed a quick salad to enjoy after church. This one fit the bill. Lots of yummy veggies and flavors and the only prep work is slicing a few things. I added more arugula than the recipe called for, to make sure that this salad would last a couple of days. It is delicious that day it is made, but it is so good a few days later. 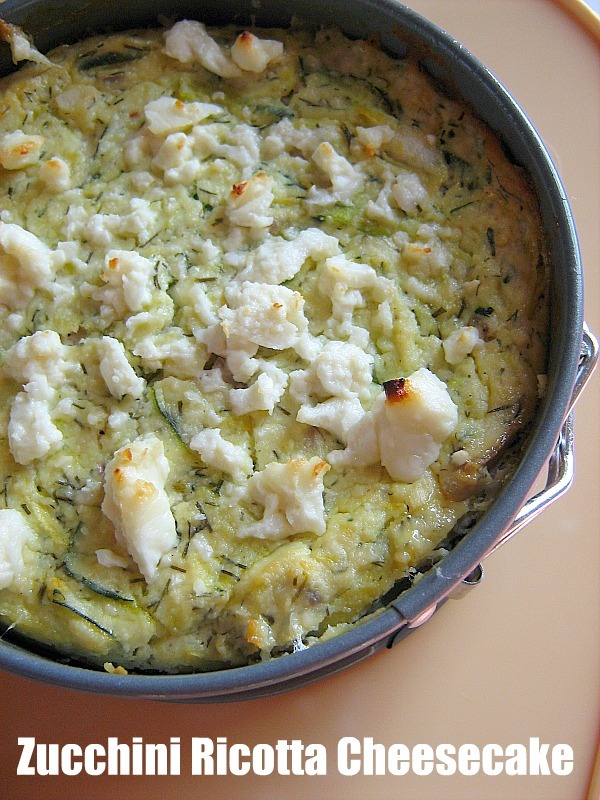 I topped it with some canned tuna a few days after my siblings went home and my kids loved it that way. I have made this salad 3 times in the past few weeks because it is so great in the summer time. Here are the results of the Eggland's Best Eggs giveaway. I used a random number generator, copied the widget results below, and the winner is commenter #21- Whitney who said "I LOVE deviled eggs and omelets!! 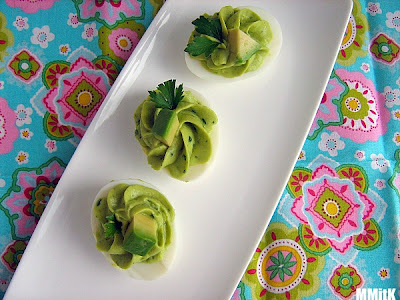 I want to make those avocado deviled eggs for a BBQ I am going to next week!Thanks for the idea!" 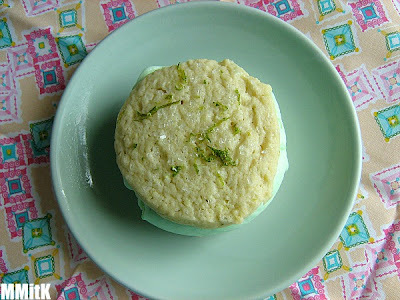 Today I am sharing a breakfast treat that I made when my sister and brother were here visiting. 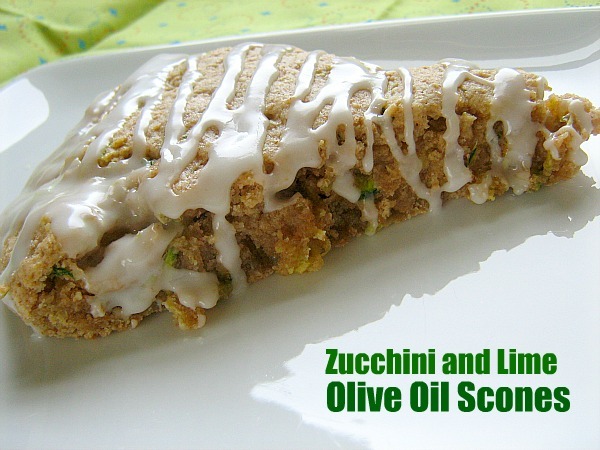 I wanted something fun that contained zucchini and saw this recipe for scones. They turned out good, but weren't really scone-like in texture. They were more like muffins. My youngest daughter absolutely loved them. I did make a few changes which I listed below. A few weeks ago I received an email from Eggland's Best Eggs, asking me if I was interested in hosting a Brinner. What is Brinner? Well, it's something that we have all done before- it's Breakfast for Dinner or simply some combination of Breakfast and Dinner. Of course, I said yes. I had some family members coming to town for a visit and I knew that would be the perfect time to have the Brinner. The hardest part was narrowing down the menu, but we finally picked out a really great one. Since eggs were the star of the show, I decided that eggs should be an ingredient in each part of our menu. We had Avocado Deviled Eggs (pictured above), Garden Turkey Meatballs, Summer Squash Bacon & Mozzarella Quiche, Sweet Potato & Chile Hash w/ a Fried Egg, and a flourless Chocolate Cake for dessert (which has a surprising secret ingredient). I had lots of help prepping the food, thanks to the family members I had visiting, so we were able to put it together quickly. A couple of friends came over and we enjoyed all of the dishes. The Avocado Deviled Eggs were a nice twist on a familiar favorite. Just imagine guacamole as the filling for your Deviled Eggs. I used Eggland's Hard-Cooked Peeled Eggs to make them. My kids also really love these eggs as a snack. The Garden Turkey Meatballs were really delicious. I finished them off in a really tasty pizza sauce. 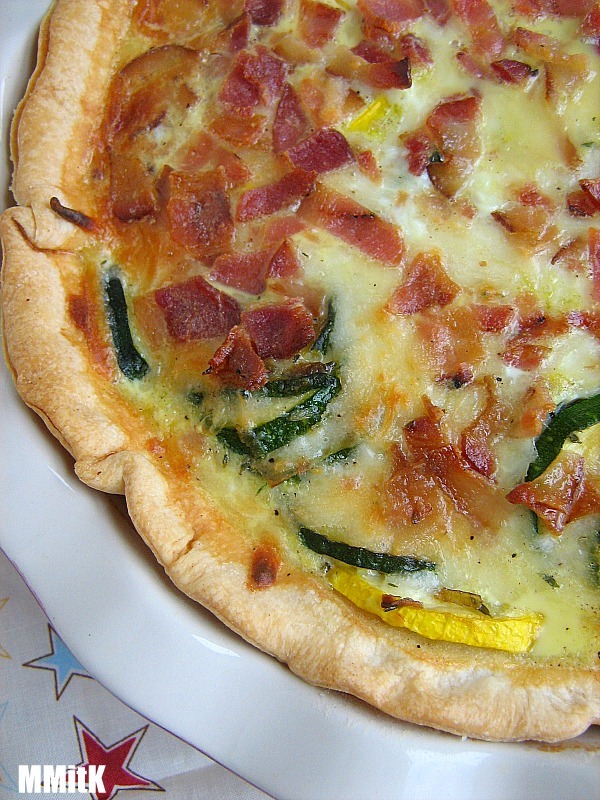 The quiche recipe was one that my sister spotted in Cooking Light and she prepared it. You would never know that is was a light recipe because it was so delicious-definitely a crowd favorite! The hash was really great too. I threw in a couple of extra veggies that I had on hand just for fun. It was spicy and yummy. 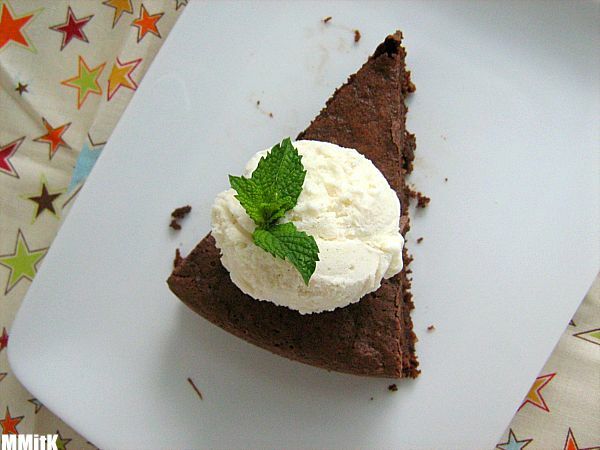 The Flourless Chocolate Cake contains a surprise ingredient that really just can't even be guessed. It was delicious. Dense and fudgy. I used Eggland's Best eggs in all of these recipes. Now, as part of the Brinner experience, Eggland’s Best provided me with a fun giveaway for you, my readers. All you have to do to enter the giveaway, is leave a comment on this post. If you want to tell me your favorite way to prepare eggs, go for it. 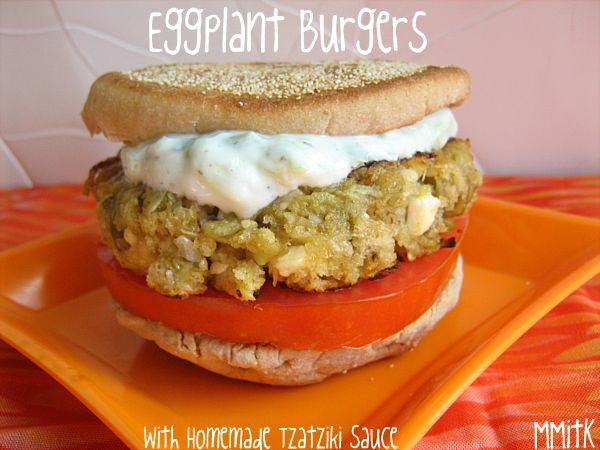 Please also feel free to share a link to your favorite egg recipe if you would like. You have until 12:00 am EST on Monday, July 11th to enter this giveaway. Hopefully you will try some of these recipes soon too and have your own Breakfast for Dinner party. Brinner can't be beat! *This giveaway is open to US residents/addresses only, age 18 and older-No PO Boxes. All the opinions stated above are my own. I was provided with VIP coupons and a giftcard to help purchase the items necessary to make these dishes. I was also provided with a package similar to the one available in the giveaway. I made this because I had 10 ears of fresh corn on the cob in the fridge and I also had cups and cups of grape tomatoes from the garden. 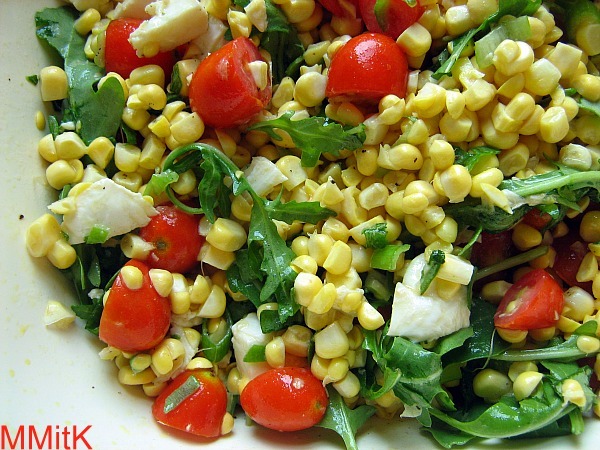 I had seen a corn and tomato salad somewhere, but couldn't find it again, so I just searched until I found one that sounded as good. The best thing about this salad is that you don't have to cook anything. The corn is just cut off the cob and combined with the other ingredients. My husband loved this salad. He had three servings. Of course, he didn't have any tomatoes in his servings, but he really loved the rest of the salad. It was fresh and delicious. This time around for the Cooking Light Virtual Supper Club, it was my turn to choose the theme. Since we are smack dab in the middle of summer here in Georgia, I decided on Sounds like Summer. The first thing that I really wanted to make was the Shrimp Cobb Salad that was featured on the cover of the June issue of CL. 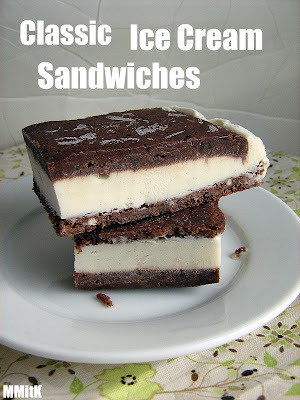 That was the plan until I saw this recipe in the July issue of Cooking Light. I have a love of risotto that is on-going. There just isn't any possible chance that I could pass up one that is chock full of vegetables. Summer veggies? Even better. This risotto recipe turned out fabulously. I was going to fix the asparagus and sugar snap peas in a different way, but decided to stick to the recipe. I put my asparagus/sugar snap peas in a ice bath after they were done blanching, so they wouldn't lose their bright green color or crispness. I just wanted to mention also that you really don't have to continuously stir risotto. Here are some of the things I did inbetween stirs- made a fresh corn & tomato salad, thawed shrimp in the sink, made peanut butter frosting, blanched some of the veggies, sauteed the zucchini & summer squash, put together whoopie pies, roasted shrimp, photographed all of the above mentioned food. And, my risotto turned out perfectly creamy and delicious. I also don't warm my broth and it still works perfectly. 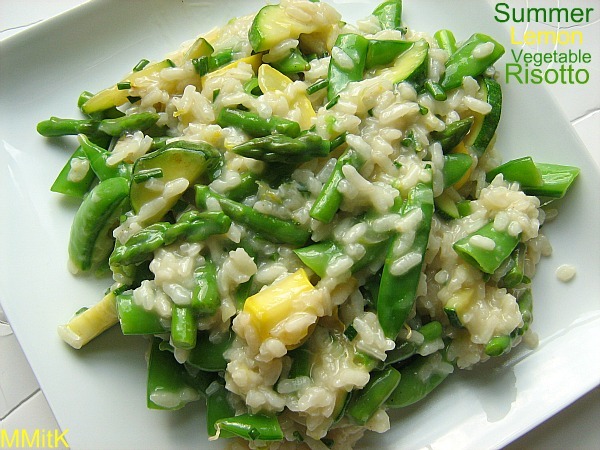 This risotto had nice hints of lemon and all the veggies made it fabulous. 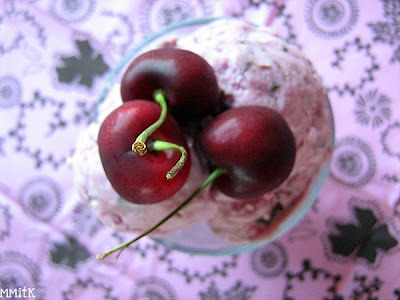 Once again, I wish that this was not just a virtual supper club- I would really enjoying trying everything on the menu!